All the essential information you need before you head out to Napa this summer! Weather: Cyprus has around 340 days of sunshine a year, so blue skies are guaranteed! Temperatures pick up as early as April, so it wouldn’t be unusual to see people down at the beach in their swimwear at Easter. During the main summer months temperatures are over 30ºC and at times will be creeping towards 40ºC. 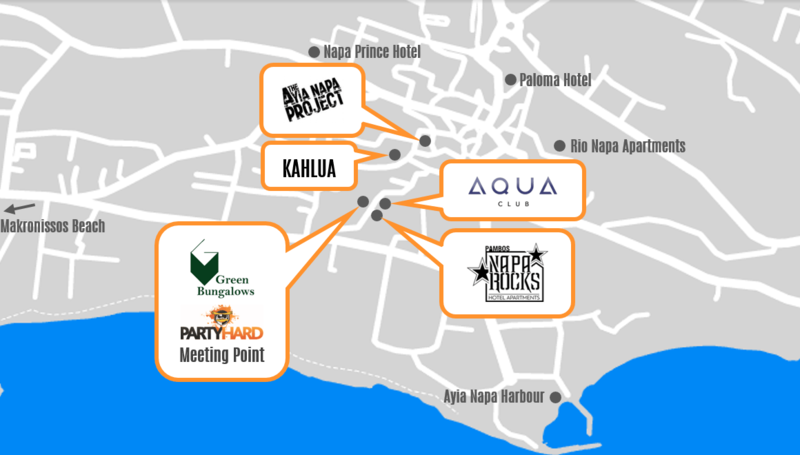 When to go to Ayia Napa: Peak season in Ayia Napa is July – August, but clubs and events are open from June-September. So if you’re looking to save some money, try June or September for your Ayia Napa clubbing holiday 2019. Health and Safety: Before you head out to Cyprus, make sure you have adequate travel and medical insurance. Although it’s not a substitute for insurance, it is also a good idea to get yourself a free European Health Insurance Card (EHIC) before you head out to Ayia Napa. It potentially entitles you to any medical treatment should it be necessary during your trip (whilst Great Britain is part of the EU) so don’t forget it when you’re packing. It’s worth noting that the EHIC will not cover you if you require ongoing medical treatment, so if you take medication long term be sure to bring enough with you in case there are any unforeseen delays to your flight home. Passports and Visas: You don’t need a visa to travel to Cyprus if you hold a British or European passport, but you will need a valid passport. Make sure that your passport is valid before you leave, and will remain valid for the duration of your stay, plus 6 months. Healthcare: In the unfortunate event of you falling ill on holiday, there are a number of places that you can seek medical help in Ayia Napa; for minor ailments you can use the chemist, and for more serious problems there are a number of medical centres. Saveco Health Centre is located just off Nissi Avenue, at the heart of Ayia Napa, and provides a 24 hour service to tourists and locals in the Ayia Napa area. Police and Security: If you are are in need of any police assistance, there is a police station located in the middle of Ayia Napa, you can reach them on +357 23 803200. In the case of minor crimes, you can dial 22-808080 for assistance. In cases of emergency, dial the emergency number 112/999 or 1499 to be put directly through to police. A lot of the hotels in Napa have their own security guards, so should you need to report anything in or around your hotel, make sure you go to them. ATMs and Currency: You will find a number of ATMs in Ayia Napa, but before you use them, be sure to check with your bank how much they will charge you to withdraw, as most ATMs will charge you a transaction fee as well. A number of clubs, bars and restaurants allow you to pay by card, however not everywhere will, so be sure to have a combination of cash and card. You can also use prepaid currency cards when you stay, which allow you to top up an amount before you leave, and budget your spending.